Weight: 12 lbs. 2 oz – Guesstimate. We will check at your 6 mos appt. Length: 25 inches – Guesstimate. We will check at your 6 mos appt. Hair: Still fluffy blond hairs and it is growing. Diapers: Size 1 – squeezing. Trying to use them all up. Likes: Being social – you love all the attention. You love kisses on your cheek and are so ticklish. It just makes you giggle! Dislikes: Mostly the car, but you’ve also started fighting sleep and it is such a sad cry. Eating: 5 ounces 5 x’s a day plus cereal, fruit, and veggies. We are introducing the veggies a little slower because Mom thinks she can make your food. She probably just needs to buy it. No more nursing. 5 months is when we quit with Landon and it just felt right to stop. No regrets and you were ready for all bottles. Milestones: Sitting up (assisted) in the jumper and in the bumbo. Not interested in rolling yet but strong enough to. Mom’s favorites: You are my happy giggly sweet boy. Love it! 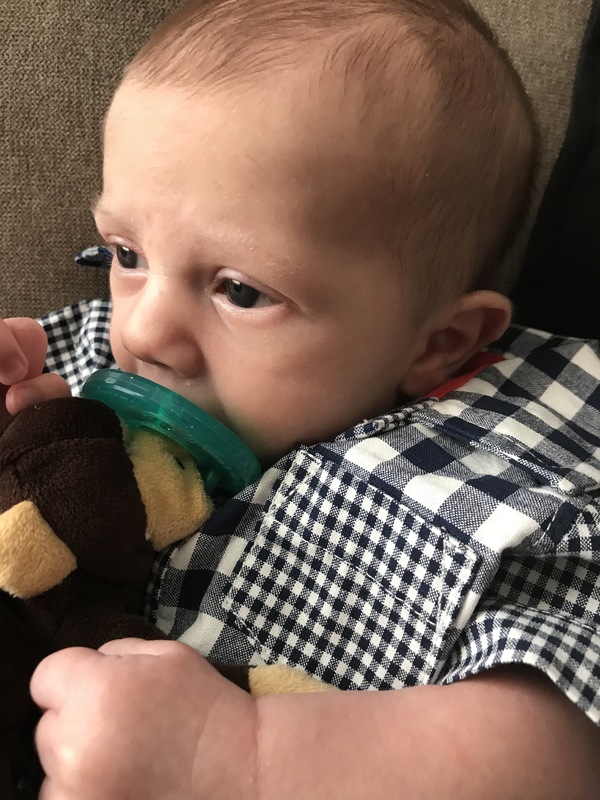 Baby items we can’t live without: Pacifiers – all the day long. 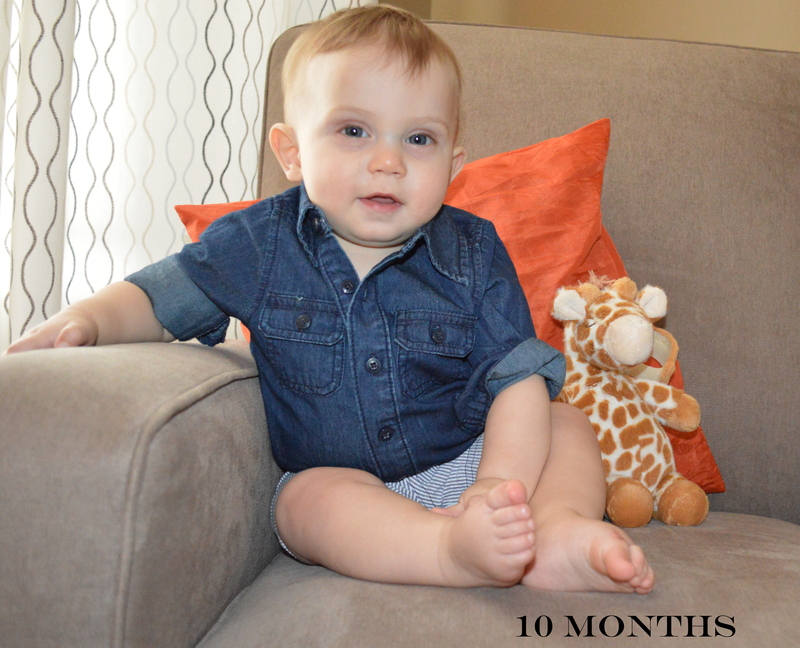 5 months….that month flew by! We love spending all our free time with you and seeing your teachers at school love on you. You are just so happy (unless you are hungry or tired – but we don’t blame you) and everyone has gotten so attached. Landon is trying to feed you when he sees a bottle and he will share his toys with you too. You are getting your bottom teeth and we expected loss of sleep and super cranky – but you are just the opposite. We just adore you and can’t wait to see what another month brings. Hair: I just noticed that you are getting more blond hairs popping through. My guess is that you will have sandy blond hair like Landon. Milestones: You had a trip to Springfield, IL to go to the memory walk for your cousin, Kendyn. You were also baptized and had so many family members travel to share in your day. You are holding your head up so well and loving your toys. We need to start working on rolling over! Mom’s favorites: You are just always happy – something that I hope you never lose. Baby items we can’t live without: Swaddle and warm onesies – you are always cold. You are 4 months and are still so tiny! We just love seeing you change, grow, and recognize your family and sweet teachers. You get all the compliments from school and they just love you. We adore you too – sweet boy! Weight: 9.5 lbs. Guessing you are staying about the same. We will find out at your 4 mo check up. Hair: Lighting up and falling out a little bit. Pretty sure your crazy dark ear lobe hair is gone too. Sleeping: You are a champion 6-8 hrs every night and you pulled one 12 hr last night. Amazing. Mommy only hopes that you get used to napping at school and are awake more in the evening. This week you have been falling asleep between 5-6 PM for the night. Eating: 4 oz every 3 hrs at daycare – longer at night if you stay asleep. You are nursing like a champ! Mommy is ecstatic! 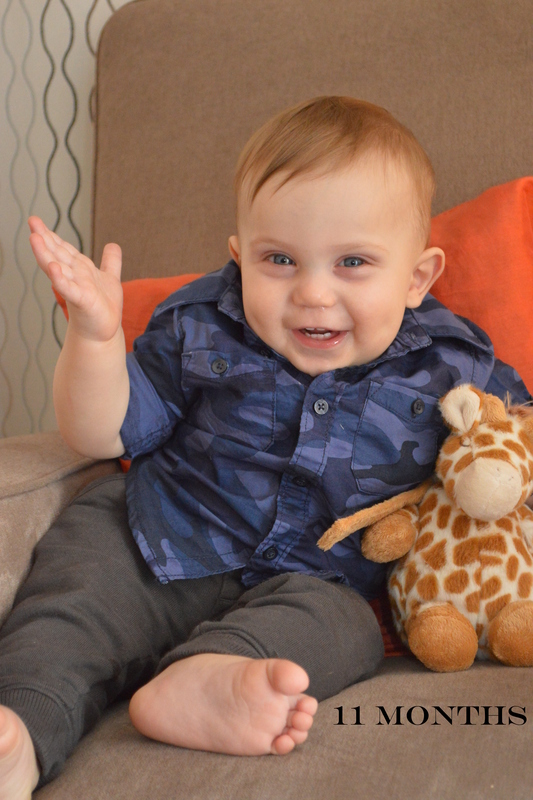 Milestones: Started daycare and so far so good. You are loving it and mommy misses you so much! You also started giggling. We figured out you are SO ticklish! You met your great Grandma and Grandpa Schwada. Grandma Kathy also came to keep you for a few days and you loved having here here! 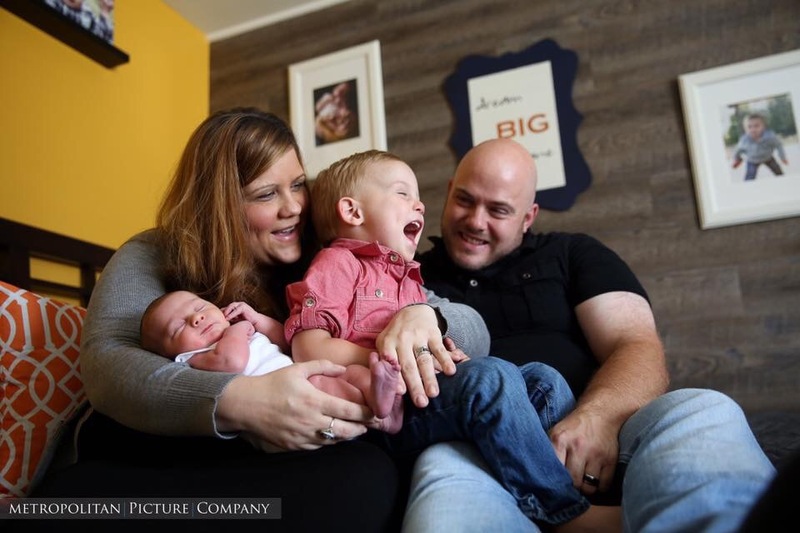 Mom’s favorites: Your sweet giggles, smiles, and snuggles. 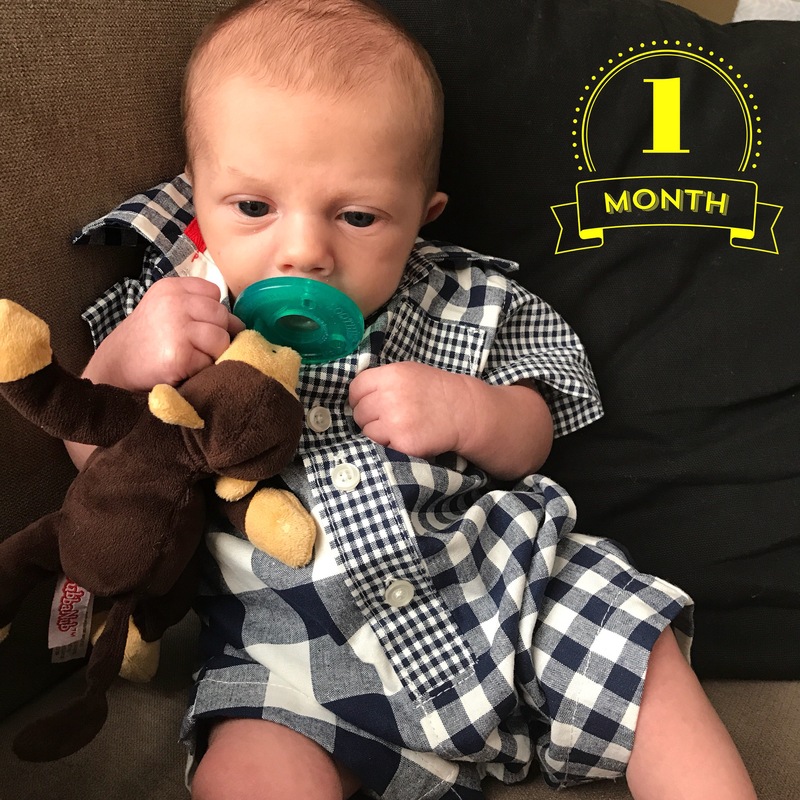 You are 3 mos and seem like such a little laid back man. You are the best sleeper and Mommy and Daddy just love your snuggles! 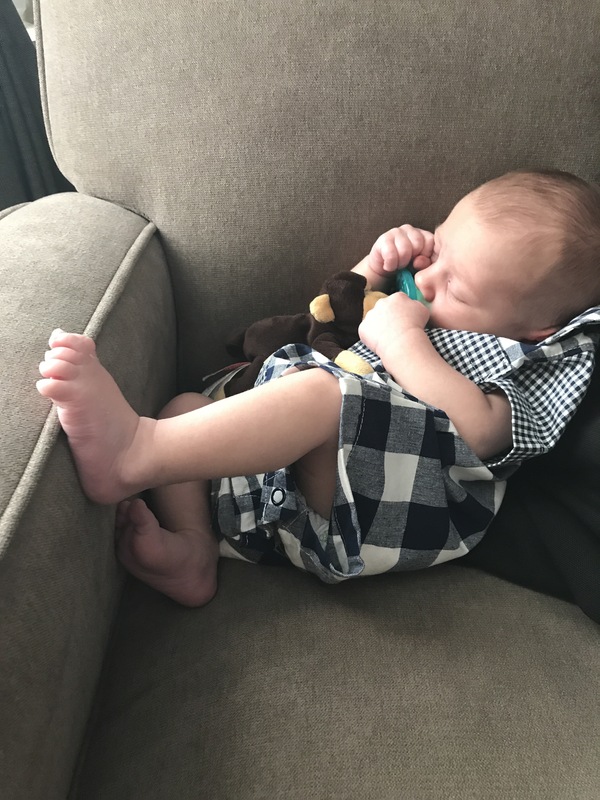 Landon mostly ignores you, but he did give you your pacifier this week and it was so sweet. He is going to take good care of you. We adore you, Maverick! Weight: 9.5 lbs. not even on the charts for weight. We have our work cut out for us to bulk you up. Length: 23 inches. About the 40th percentile. Hair: Still dark and growing! You may have one spot that looks a little thinned on the back of your head. 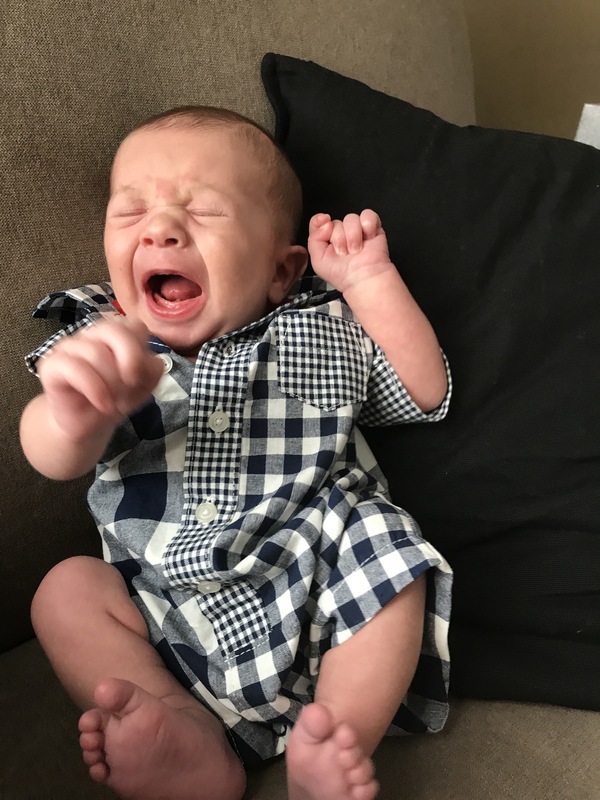 Clothes: Newborns are snug in the length and short on the arms. We are pushing the 0-3 and 3 mos. You always pull your legs out of them. You still LOVE warmth so I’m struggling to get your summer clothes worn. Sleeping: We worked hard on crib training this month, but still have some work to do on naps. You are sleeping 4-6 hrs at night with a bigger feeding at 10 PM. Eating: 2.5-3 oz every 3 hrs – longer at night if you stay asleep. Still working on nursing, but mostly bottles and very little formula. Yay! Mom’s favorites: Your personality is starting to show and I’m reminded that it is so hard to go back to work. You are such a laid back baby. Baby items we can’t live without: soft blankets and the Moby. Another month has flown by and we have loved every minute with you. We’ve shared you with lots of family this month and you are so easy going – except that car ride to IL with mom and Landon. You screamed for a good part of it – but we made it! Mommy is cherishing all the days that remain with you at home until you start daycare. We love you to pieces! Sleeping: Oh my word. My fave update…you started sleeping through the night one week before your birthday. It has been absolute BLISS! We sometimes rock you, but you love to just lay in bed and go right to sleep. Likes: (Lots the same as last month) Outside, being on the go, people watching, pushing anything you can (highchair, toys, etc) all over the place, playing with Dad, snuggles with Mom, w, doors (opening and closing), getting into all the cabinets, making lots of noise, watching videos on Youtube, any song on TV, putting everything in your mouth, and now WALKING. You are busy! Dislikes: You dislike sitting in the bath tub. You do not like anyone wiping your face at all. You also have a pretty sweet “mean mug” and use it when you don’t like something. I need to get a photo of it. Eating: Off bottles completely – YAY! You have 3 meals and 2 snacks a day. You have been drinking milk and water. They may have snuck some juice in at school, but we are trying to hold off on that as long as possible. Milestones: WALKING, off the bottle, sleeping through the night. Wow…lots of changes this month. You are such a big boy! Mom’s favorites: You are so ticklish and think it is hysterical when we tell you your feet stink. Such a boy! Also loved to see you attack your big cupcake at your birthday. You love sweets like mom and dad! Baby items we can’t live without: We love the gerber baby cookies and you have one every night at dinner. You have had such a great month of development. Walking, all table food, and sleeping through the night have been fantastic! You also are moving up to the 1 yr old room at daycare. We are going to miss your teachers. They worked so hard with you on walking. You were the ring bearer in Aunt Erin and Uncle Bill’s wedding and had fun with your walker toy at the reception. 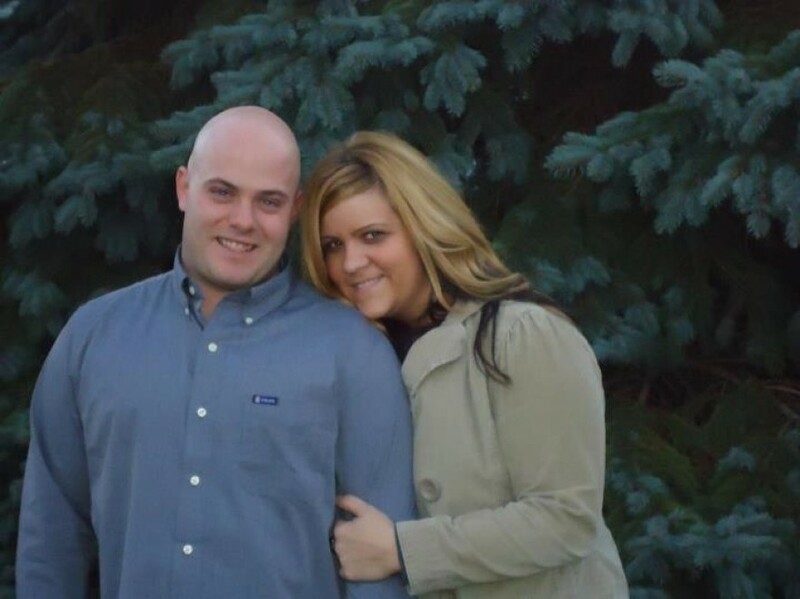 You were one week shy of walking at their wedding…so crazy! We celebrated your birthday on Thanksgiving day at Grandma Kathy’s house. We sang “happy birthday” and you attacked all the icing on your cupcake. You were also spoiled with so many gifts and clothes. Those in attendance: Grandma Kathy, Tom, Aunt Erin & Uncle Bill, Uncle Nathan & Aunt Kristin & Brynzlee, Uncle Ryan & Aunt Donna & Dylan & Jacob, Great Grandma Betty Mullink, and Betsy Miller. We also Skyped with Grandma and Grandpa Jones in Dallas so that they could see you and your cake. So special! In the next month you will move to the 1 yr room at school, celebrate Roe and Jones Christmas, and spend lots of time with mom while dad works his very busy season. We can’t wait to watch all of your changes this month. We love you more every day! Hair: Hair is getting thicker and still a dirty blond. Clothes: Started in the 12 mos tops and keeping 9 mos shorts to finish out the warm weather. Will transition into 12 mos pants when we are in full fall (chilly) weather. Sleeping: Still struggling for consistency with the sleep. You are good 2-3 nights a week and the others you are up 1-2 times a night. Traveling with you is the most difficult at night – you never sleep! Still get 2-3 naps a day. We will have to transition you to one nap for the 1 yr old room at school. Hopefully that will help you at night too! Likes: Same as last month…music and being on the go! You also love the baby channel on TV. Harry the Bunny has stolen your heart! Dislikes: Being tired and the end of the day routine. You usually pitch a fit getting into pajamas until you get your bottle. Eating: Down to 4 bottles a day plus having a “meal” for breakfast, lunch and dinner. You have started on some table foods and love mashed potatoes, turkey, string cheese, and spaghetti. You will eat pretty much anything we put in front of you. 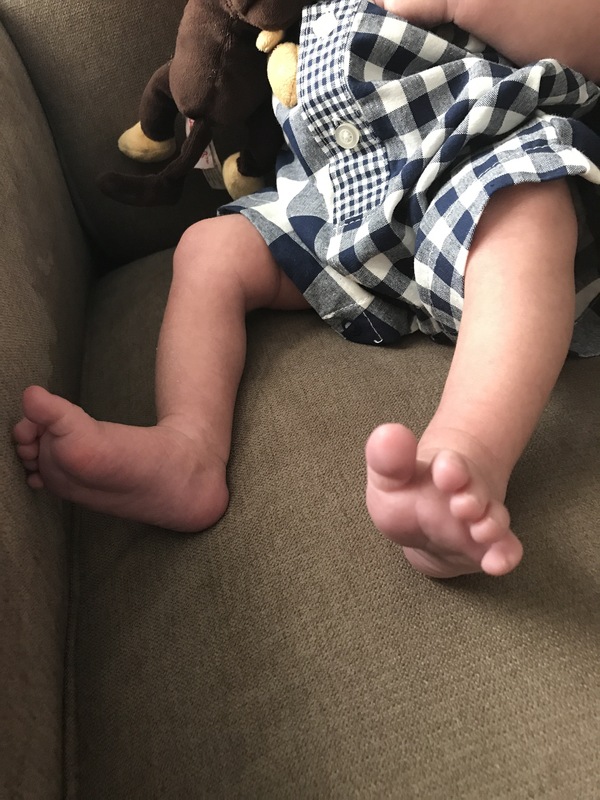 Milestones: You are so close to walking! You can walk behind your walking toy unassisted (this made mom excited and cry all at the same time). You are cruising and pulling up on everything. We had to put a cover on the crib because you are a biter and chew on anything…including the crib rail. I believe you are labeled as the “biter” in your classroom and mom and dad sign 2-3 accident reports a week. You scream “mamama” either babbling or when you are upset. Dad taught you how to “high five”. You had pink eye and a double ear infection at the end of this month. Let’s hope we stay out of the pediatrician office until your 1 yr appt! We need lots of energy to keep up with you. Mom’s favorites: You are starting to become more independent but you still love to snuggle. I love both of these equally. Baby items we can’t live without: Baby food pouches. Why am I late to this game? Love them! You have had a great month visiting with family, going to Grant’s Farm, attending Aunt Erin’s bridal shower, and exploring everything you can get your hands on. You were gifted the most precious highchair from Georgia Maneke (Grandpa Roe’s 1st cousin). The highchair was used by your great grandma Roe and her brother (who is Georgia’s dad). Is is absolutely beautiful and we are thrilled to use it for many years to come. 2 months left until you are 1 yr old. Can’t believe it! We have lots to do the next few months and can’t wait to see how much you change. Love you always, Landon. Weight: You are still 21 lbs., so no significant growth in weight. Hair: Still filling in and getting longer. Your dad is officially jealous of all your hair! Clothes: Fitting in some 12 mos pj’s. 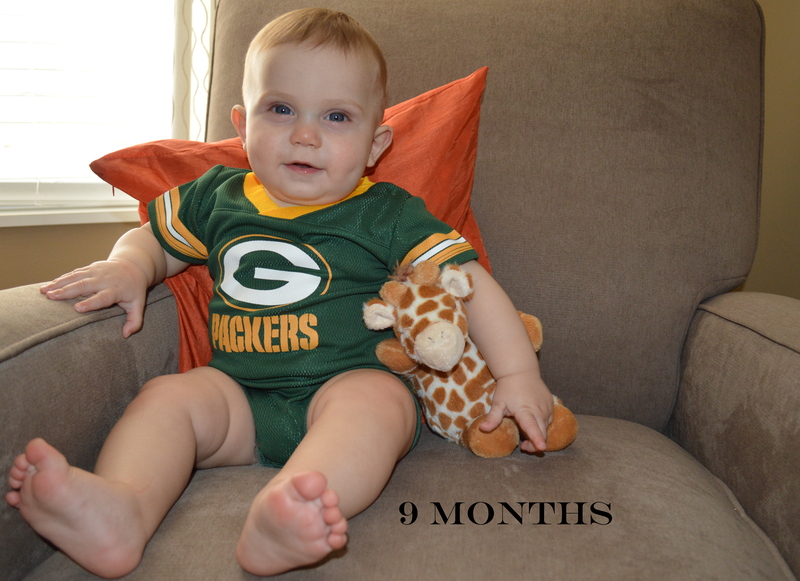 You are in 9 mos clothes and some 6 mos shorts, but we will have to go into 12 mos very soon. So sad putting all those clothes in storage! Diapers: Movin’ on up to Size 4. We got some advice from Mom’s friend and bought the Pampers Overnights in Size 4. Lifesaver! Sleeping: You are not consistently sleeping through the night, although when you do – we love it! Your naps at school are 40 min 2x a day. They think you are crazy that you won’t sleep and you usually come home so tired. Some days you will take a nap on the way home. Bedtime is still 8:30-9. Likes: Anything with music and making noise. You love to be on the go and need to move around constantly to keep busy. Dislikes: You’ve started gagging on your food. You are a total texture guy. Eating: Continuing the same as last month but also incorporating table food. Yum! Working to incorporate more in your meals so that we have a good update at your 9 month.Still on 6 oz. formula. We are working on deleting one bottle a day and taking on 3 “meals”. You are getting 22 oz a day between 4 bottles, oatmeal/fruit for breakfast, veggies at lunch, and another oatmeal/fruit dinner. We will be working on picking items up with your two fingers this month. 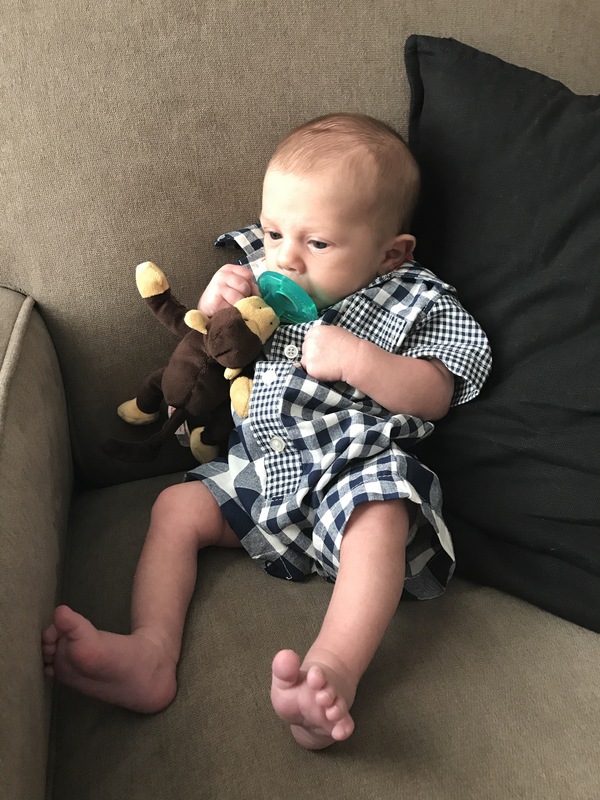 Milestones: You were baptized on Sunday, August 9th. Your 8th tooth popped in this month! You are all over the place. You scoot around on the floor and everyone cracks up at your army crawl. Dad worked with you all day on a Sunday and you have now mastered the walker and can go all over the hard surface floors. You love it (and we do too!). You have really started full interactions and “pouting” when you don’t get your way. You have also moved up to your new classroom – Starfish. You are the youngest of the bunch and have to work hard to keep up with everyone. Mom’s favorites: Your laugh and smile. By far – the best parts of the day! I love to walk in your room in the morning when you have slept all night and wake up happy. You are just so precious. Baby items we can’t live without: Now…the walker. We will take that thing everywhere (and we do!). You have changed so much this month and we are enjoying keeping up with you and seeing your personality continue to shine through. You have been so good “on the go” and keep up with our crazy schedule very well. We love you to pieces! Month 9 will include a weekend in St. Louis with Uncle Nathan, Aunt Kristin, and Brynzlee – along with a trip to Grant’s Farm. We are heading to Decatur for Aunt Erin’s bridal shower and you will be partying with the girls. We also have a few weekends at home preparing for our vacation at the end of September!